The symposium’s talks and workshops aim to enrich classroom environment through exploration and hands-on activities. The event is going to take place on TBA. PUA 3rd international ELT Symposium on Creativity in the classroom is an excellent platform for educators, teachers to exchange ideas, experiences, opinions and a wide range of practical classroom ideas for how to cope with the pressure of keeping up with the curriculum and making time for creativity, and give space for both teachers and students to think outside the box. acting as a channel for development on both personal and professional levels. Each attendee will attend two different workshops, each lasting for 45 minutes. There will be 7 workshops running at the same time, followed by seven other workshops, so each attendee will attend 1 hour and a half in the “workshops” section. 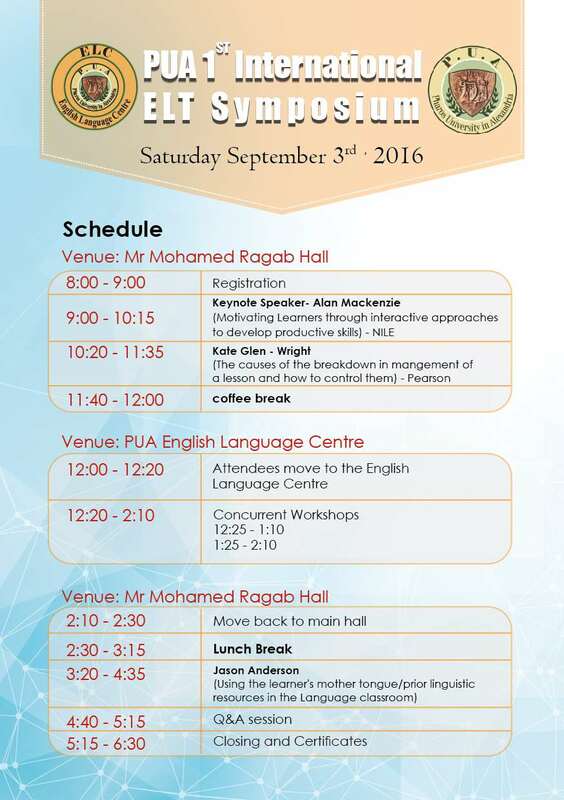 Interested candidates are invited to submit their abstracts and participate in PUA 3rd International ELT Symposium. It is required to submit a 3-minute video presentation of the abstract. Deadline for submitting your abstract is June 2nd, 2019. The symposium was organized by Pharos University – English Language Centre in collaboration with reputable publishers and institutions. The event took place on September 16 th, 2017. The symposium’s talks and workshops aimed to enrich classroom environment through exploration and hands-on activities. PUA 2nd international ELT Symposium on Innovation in Education was an excellent platform for researchers, educators, teachers to exchange ideas, experiences, opinions and a wide range of practical classroom ideas for novice and experienced teachers. 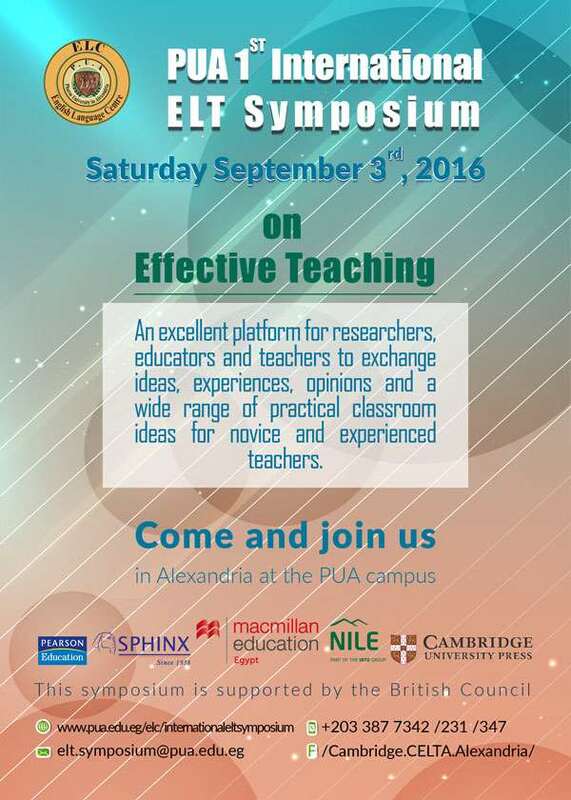 Pharos University 2016 ELT Symposium is the first of its kind to be held in Alexandria. The symposium’s talks and workshops aim to enrich classroom environment through exploration and hands-on activities. 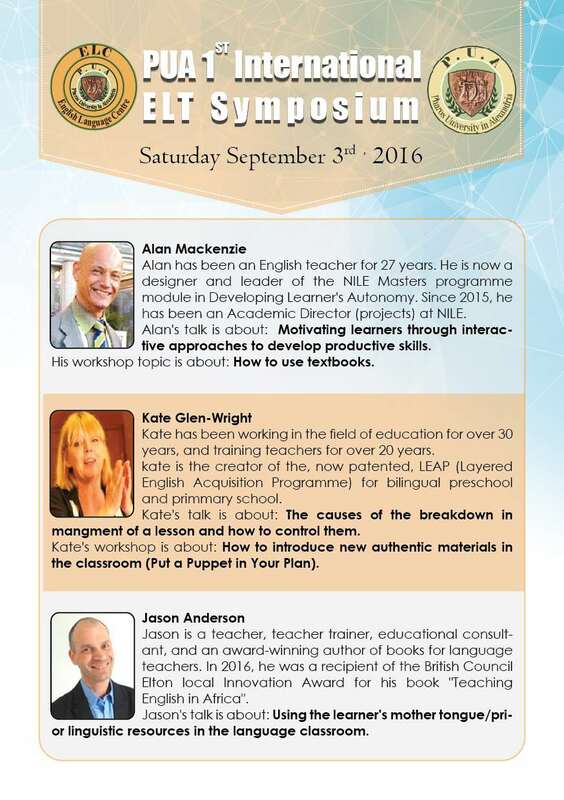 The ELT Symposium on Effective Teaching is an excellent platform for researchers, educators, teachers to exchange ideas, experiences, opinions and a wide range of practical classroom ideas for novice and experienced teachers. 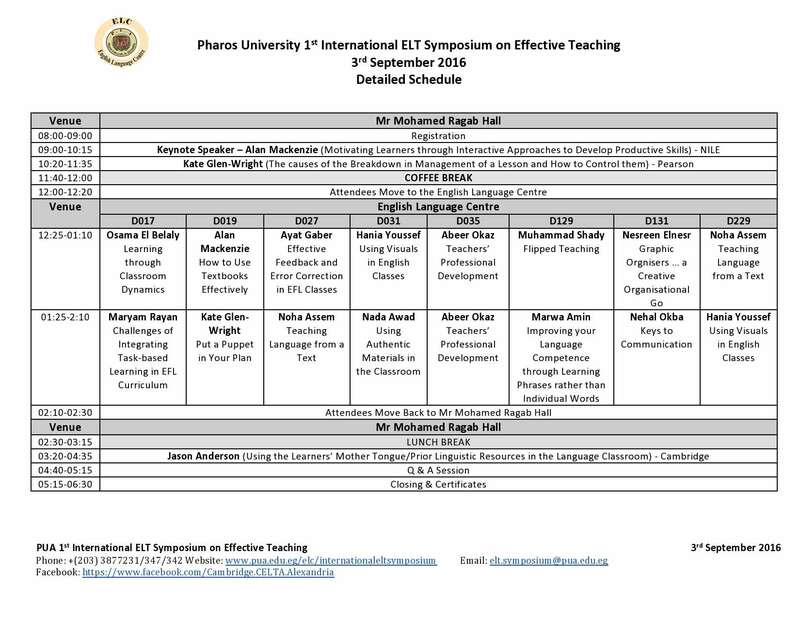 You are invited to join PUA 1st International ELT Symposium on Effective Teaching at Pharos University in Alexandria. September 3rd will mark as an excellent platform for all attendees to exchange ideas and experiences about language teaching and practical classroom ideas. 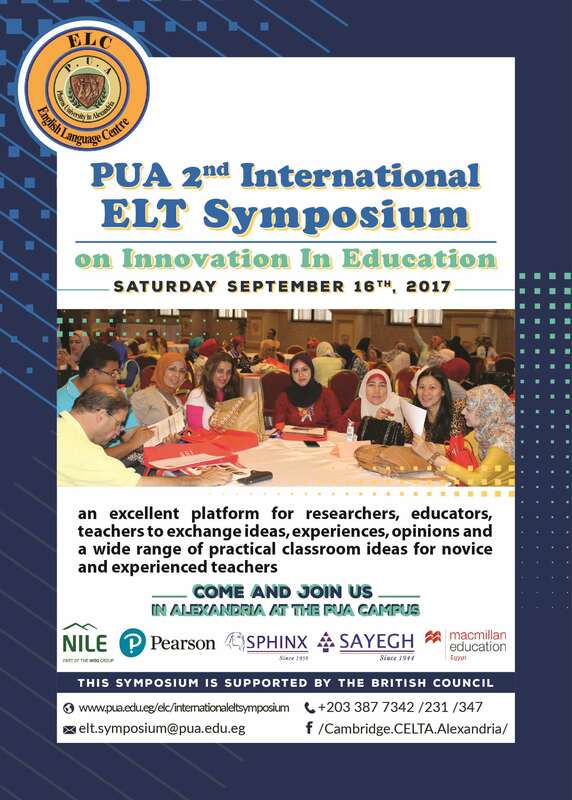 You are invited to submit your abstracts and participate in PUA 1st International ELT Symposium by giving presentations or workshops. Click here to know about the symposium’s topics. Deadline for submitting your abstract is mid July. Oral presentation: a 35-minute presentation covering a new teaching idea or technique.